We continue to have rain... every day... looks like the sun doesn't appear until next week sometime.. WOW! Well it feels liks FALL ... even if its just the eve of Autumn. Cooler temperatures are hear, but really its just the chill of the rain, because its still mid 70s. I like the Autumn season. I like to think that its my last chancen to get out with nature, before the 'white stuff' hits the ground. I really am loving this new stamp set.. Gently Falling. Not only does it have a variety of leaves in it, but I love the two step. I used Vanilla CS as my base. Then stamped the leave images from Gently Falling in Cajun Craze, Wasabi, Baja Breeze. The I layered it on Chocolate Chip and used dimensionals to give better effect. 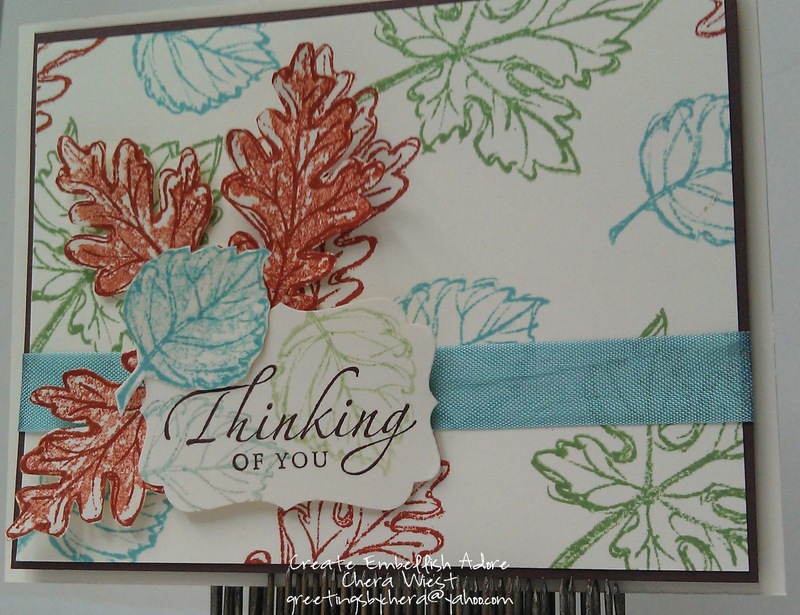 I cut out some leaves and adhered it on the Baja Breeze Seam Binding Ribbon. The Thinking of you is from Sincere Sentiments. I then punched it out with the Decorative Label punch. 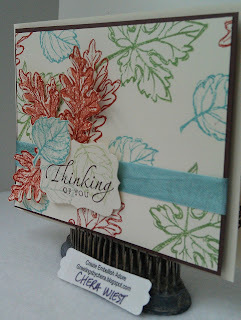 I did stamp two leaves on the label - after I stamped off the ink. 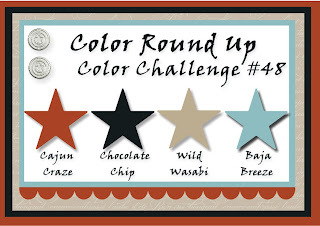 I used a Color Challenge by Rubber Rednecke -but as I was setting up my supplies I noticed the colors and words didn't mix.. but I used the words.. not the actual colors.. and then saw it was corrected.. OK, so I guess I do not enter! The correct colors are those that are shown... not the written words below! LOL GO FIGURE! OH WELL... I still have time to get it right!! 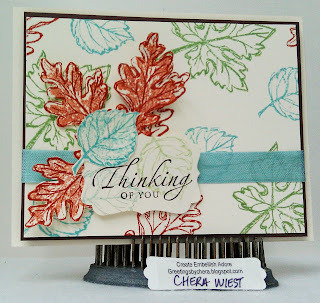 Love those colors and that stamp set is calling my name. Great job, wish we had some of rain. Oooh, I really like this color combo with the stamp set you chose. TFS!! Nice arrangement of the leaves.. very pretty!